My hair is thinning because of excessive hair loss. It is now very alarming so I'm thinking of consulting a specialist. I don't want to get bald like my female friend. I did some research about the cause of hair thinning in women and this is what I have learned. 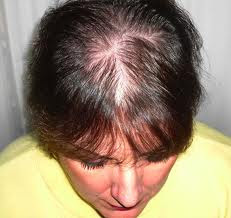 Thinning of hair in women usually starts after menopause when the production of the female hormone estrogen slows down dramatically. The high levels of estrogen in a woman system protect her from the small amount of testosterone that women also produce. What is testosterone? Testosterone is usually thought of as a male hormone, but women also produce it in small amount. It is the women's ovaries and adrenal glands that are responsible for testosterone production. Testosterone helps women maintain muscle and bone strength, however it can also cause hair thinning when produced in excess amount. The produced testosterone combines with the enzyme 5 alpha reductase which creates DHT, the one responsible for female pattern baldness. Since I'm not in the menopausal stage yet I'm wondering what causes my excessive hair loss. Well, I guess I really should consult a doctor. Hair Extra is exactly as the name says, it is an excellent solution for the hair problem as Hair thinning, fuller hair, Hair loss, Hair loss conceal, Thicker hair . adding more hair to your head naturally and effortlessly, it is a superlative hair loss products. perfect Solution For Balding.